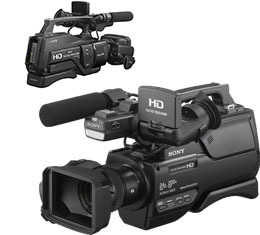 The HXR-MC2500 is capable of shooting clearly even in low-light or indoor environments. Its highly-sensitive Exmor R CMOS sensor adopts a back-illuminated technology that enables the image sensor to utilize incidental light more efficiently, helping the videographer to achieve rich image quality even during low-light shooting situations. Moreover, the HXR-MC2500 is also equipped with a convenient built-in LED light for valuable extra illumination when needed. The all new Optical SteadyShot feature ensures smooth movement while recording footage in many challenging shooting situations. In addition, Sony's innovative 3-Way Shake-Cancelling technology adds electronic roll stability for even smoother video capture. This latest version of image stabilisation technology realizes images that are up to 10x steadier for wide angle shooting than conventional Optical SteadyShot images. As the user zooms in, an intelligent digital image stabiliser starts to blend in and work together with its optical counterpart to effectively reduce camera shake. This technology also reduces shake in the rolling direction that commonly occurs when shooting while walking.